The Kula Forest Reserve has been closed after it sustained extensive damage from the storm that occurred last week. WAILUKU » State officials have closed the Kula Forest Reserve on Maui due to extensive storm damage to the access road and uprooted and snapped trees. State Department of Land and Natural Resources spokeswoman Deborah Ward said yesterday that high winds and severe rain also washed out road areas last week. She said the fallen trees will need to be cut and removed. The forest reserve is closed at the white gate and the Skyline gate, and closure signs are posted, state officials said. DLNR Director Laura Thielen said 2007 was an "uncommon year for the Kula forest," with a devastating wildfire Jan. 23 to Feb. 2 that burned 2,300 acres. 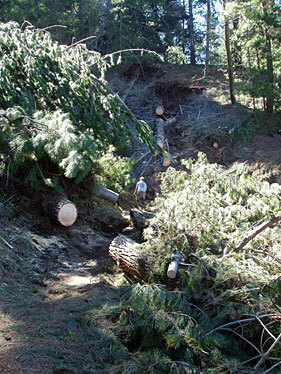 Thielen said a major reforestation effort had just begun when the storm hit. "We have not yet been able to evaluate the effect of last week's storm on the seedlings," Thielen said. WAINIHA, Kauai » The state Department of Transportation will close a portion of Kuhio Highway on the North Shore to replace two bridges damaged in October. The highway, the lone road linking portions of the North Shore to the rest of the island, will be closed from Lumahai Beach to Powerhouse Road in both directions from 8 a.m. tomorrow through 8 a.m. Thursday. Boats and vans will be provided for local residents, those with businesses, and guests with lodging west of the Wainiha bridges. Visitors, however, will be discouraged from entering the area. Parking areas will be provided on both sides of the closure for those requiring shuttle service. State officials said that police, fire and emergency services will be provided across the bridges. Wainiha Bridges Nos. 1 and 3 were damaged in October by an overweight truck. Weight limits were lowered, and the bridges were monitored 24 hours a day for the past few months. The cost of replacing the bridges is estimated at $4 million to $6 million. Police are looking for a man who tried to rob a Pearl City store at gunpoint Sunday. At about 6 p.m. the man made a purchase at the store and, when receiving his change, pointed a black semiautomatic handgun from under his shirt at the clerk, 74, and demanded cash, police said. The clerk was startled, police said, and knocked the cash drawer closed. The man fled the store. Police described him as in his 30s, about 5 feet 8 inches tall, 160 pounds, with a slim build and straight black hair. Big Isle police arrested and charged a Puna man with multiple drug and weapon offenses. Oscar Martinez, 27, was arrested Friday after police responded to a call about a marijuana-growing operation on Lehua Road in the Fern Acres subdivision. Police recovered 704 pot plants. Officers also recovered an unregistered rifle with ammunition. Martinez is wanted in California on drug charges, police said. He is in jail pending a court appearance.